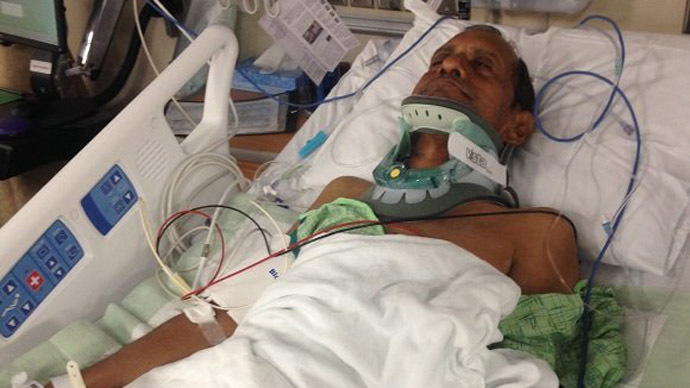 ​An Alabama cop is under investigation after allegedly using excessive force while handcuffing a man visiting from India who has since been diagnosed as partly paralyzed. The altercation occurred last Friday when Sureshbhai Patel, a 57-year-old Indian citizen from the small town of Pij, was approached by an officer of the Madison Police Department while outside his own son’s home in an affluent up-and-coming community in northern Alabama. Police say they were responding to calls concerning a suspicious person in the neighborhood when they confronted Patel, according to a statement provided to the AL.com news portal, and learned he did not speak English. According to local news network WHNT, Patel’s son said his dad told the officers: “No English. Indian. Walking,” then pointed to the family home he had been staying in for less than two weeks. The officers then attempted to search Patel, according to the police. But when the man allegedly put his hands in his pockets and pulled away, one of the cops forced him to the ground. "He was just walking on the sidewalk as he does all the time," his son, Chirag Patel, told AL.com on Tuesday. "They put him to the ground." “The only thing that would have been suspicious is that he was of brown skin,” Hank Sherrod, an attorney for the Patel family, told RT on Wednesday. Not only did the incident end without arrests, but Patel had to be hauled off to an area hospital temporarily paralyzed. At first he was unable to move his legs and had limited motion in his arms, but some mobility was restored after doctors performed cervical fusion surgery the next day. "This is just one of those things that doesn't need to happen," the lawyer told AL.com. "That officer doesn't need to be on the streets." Indeed, the Madison Police Department has since placed the officer on administrative leave pending the results of an internal investigation, and soon the agency may have a better idea of what exactly happened. Capt. John Stringer, a spokesman for the force, told AL.com that both audio and video exists of the incident, but the recordings will be kept from the public for now, since they are considered evidence in the internal affairs probe. “You only release the video and the audio , which they admit they have, but you only release that when it supports you. You don’t do that in this case when obviously you’re concerned it doesn’t,” Sherrod told RT. Also sealed, for the time being, are the names of the two officers who responded to the suspicious person calls. "The Madison Police Department takes all use of force incidents seriously and reviews them as a matter of policy," the department said in a statement. Chirag Patel, the victim’s son, came to the United States roughly a decade ago, according to AL.com, then attended college and married a US citizen. After gaining full citizenship in 2012, the older Patel was approved for permanent residency on account of being an immediate family member, the news portal reported. “He came here to help; he came here to be a granddad,” Sherrod told RT.